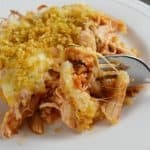 This easy chicken parmesan casserole is a cheesy, crowd-pleasing casserole that can be ready to bake in 10 minutes. A super easy weeknight meal that will feed a whole crowd. This casserole is an alternative to the classic chicken parmesan dish with all the same great flavors you love like cheese, sauce, and a crunchy topping for that perfect parmesan flavor. It’s so easy you will never want to make it any other way. Not to mention that it is freezer friendly so you can make it in advance on the weekend and ready to pop in the oven during the week. Just be sure to allow it to completely thaw before baking. 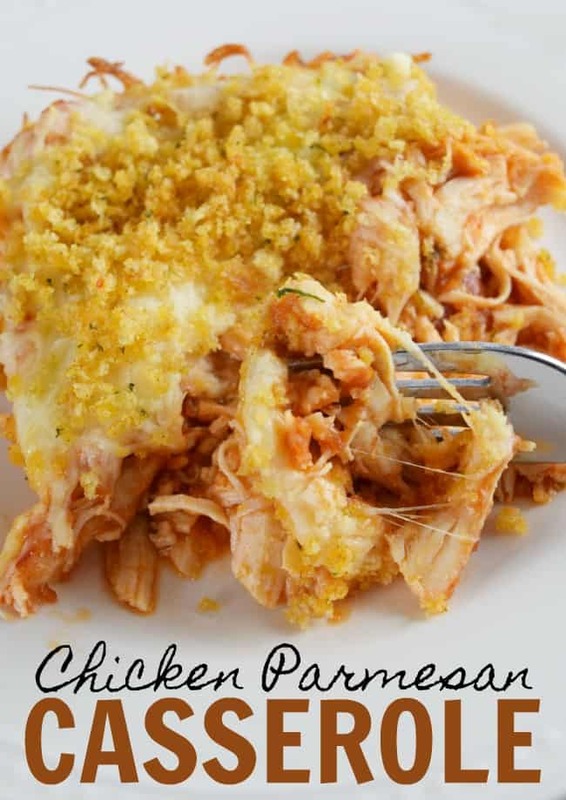 Your first step in making this amazing chicken parmesan casserole is to cook the chicken. I find it easiest to just boil it. Also, you can go ahead and preheat your oven to 350 degrees and prep your baking dish with a little bit of non-stick spray. Once your chicken is completely done you will want to shred it up or you can dice it up into small bits as well. We prefer our chicken shredded so I pop it into the Kitchenaid and let it shred it for me. Yes… that really works! 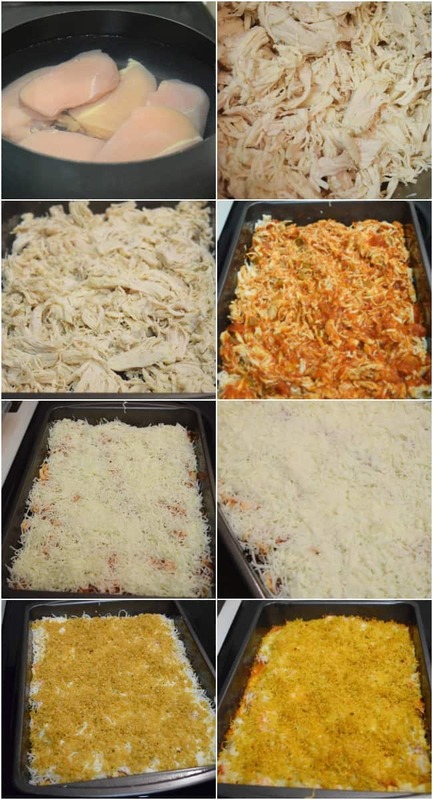 Place your shredded or chopped up chicken and spread evenly covering your 9×13 casserole dish. Now it’s time to add your sauce. You can use marinara sauce, which is pretty common for chicken parmesan, but I much prefer to use my favorite pasta sauce. I just like the taste better. Add it to the chicken and stir to combine. Top with shredded mozzarella cheese and then top with shredded parmesan cheese. You can also use the canned parmesan like you would put on spaghetti or pizza. No need to purchase extra. The last step is to add your 2 tablespoons of olive oil and stir it around with your panko crumbs. Once your crumbs are nicely coated crumble them on top of the dish. Back for 25 minutes or until the crumbs get a nice golden brown. If you love chicken parmesan casserole with pasta then I would definitely recommend making a batch of spaghetti to go with this awesome dish. Just make it separate and add a slice of this right on top. You could really make any of your favorite pasta to go along with it. You will first want to boil your chicken and shred or chop into pieces. Preheat oven to 350 F and grease your casserole dish with non-stick cooking spray. Place shredded or chopped chicken in baking dish and pour your desired sauce over the top. Stir to combine. 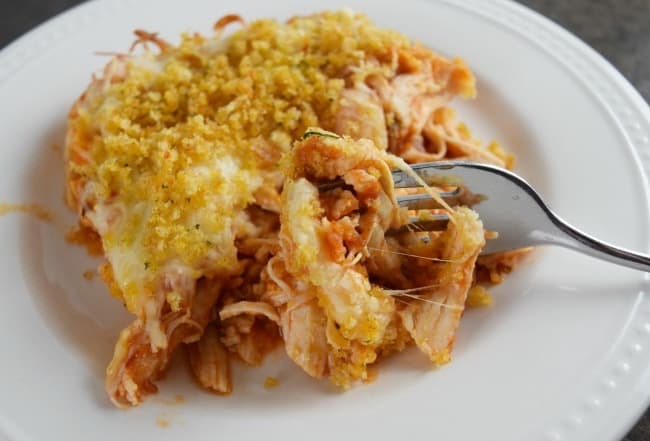 Spread shredded mozzarella cheese over the chicken and sprinkle parmesan over the top as well. In a separate bowl stir together your breadcrumbs and 2 tablespoons of olive oil. Sprinkle the breadcrumbs over the cheese and bake 25 minutes until the breadcrumbs are golden brown. This dish is freezer friendly. You can make it in advance and freeze until ready to eat. Just be sure to allow it to completely thaw before baking.